For any business or organization that wants to be able to supply evidence for investigation, dispute resolution or liability protection, the ability to demonstrate who said what and when is a powerful asset. Quantify Recording Suite from Red Box enables you to not only capture recordings from a wide range of sources but also rapidly locate and review information to accurately reconstruct incidents as they occurred. Quantify Event Reconstruct allows investigation and compliance teams to place important recordings that have been captured across multiple communications sources into a single dedicated workspace. 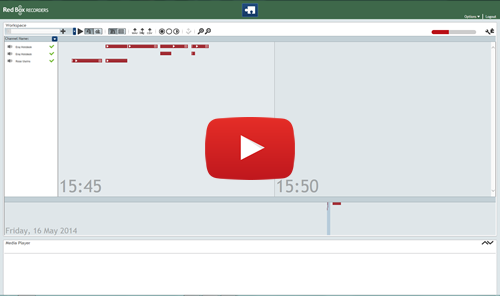 Teams can use the Event Reconstruct workspace to visualize recordings across a timeline and accurately recreate events by replaying recordings sequentially and concurrently. Important case notes can be added and recordings easily shared for internal and external disclosure. Quantify authenticates recordings so that all collated evidence is court-admissable. Organizations in the public safety sector regularly need to gather evidence to reconstruct incidents for analysis and legal disclosure. Responding to emergency situations can involve multiple individuals communicating across fixed-line, cell phone and radio networks. Quantify Event Reconstruct makes it easy to replay recordings captured over multiple channels simultaneously, allowing you to piece together incidents to create a visual timeline of events as they took place. It’s particularly helpful for investigation teams that need to provide evidence for disclosure. When important communications need to be retained, Quantify CallSafe enables recordings to be placed into secure storage where they are exempt from a standard retention cycle and held indefinitely. The ability to locate recordings and reconstruct trades is a key element of financial regulations such as CFTC 23.202 but gathering evidence can be laborious and time-consuming. The process is complicated even further by the fact that reviewing trading activity can involve bringing together evidence from across multiple sources such as fixed-line and mobile phone calls, as well as SMS. With Quantity Event Reconstruct, compliance teams can quickly piece together information from multiple recordings and sources to create a visual timeline of a trade. All related files are consolidated into one convenient workspace which offers the ability to add notes and replay recordings sequentially and concurrently. Contact centers require an easy-to-use solution to help resolve customer disputes and conduct internal investigations. Gathering evidence can be hugely time-consuming though, especially if there are multiple recordings to be reviewed. Quantify Event Reconstruct addresses this challenge by enabling incidents to be quickly compiled from multiple sources. More than that, it helps you create a visual timeline of events and replay all recordings sequentially or concurrently. With Red Box Quantify, don’t pay for features you don’t need. Just select the ones that work for your business or organization.